Inspired by the rubberwood trees of his youth, the founder and president of Thailand-based PlanToys, Vitool Viraponsavan, earned a degree in architecture and set out to build a more sustainable world one rubberwood toy at a time. Historically, when a rubberwood tree stopped producing latex, it was burned. In 1981, PlanToys became the first company to transform these natural beauties into eco-friendly play things. The company has also created a proprietary durable composite wood called PlanWood made from reclaimed wood particles leftover from their eco-friendly manufacturing processes. 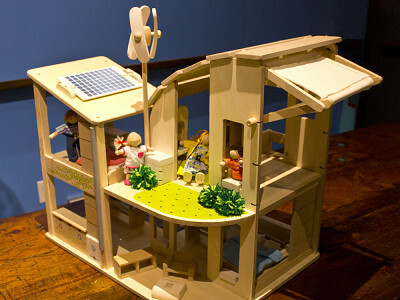 The Green Dollhouse turns green living into everyday play with a list of environmentally conscious features that inspire children’s imagination, while at the same time promote the 3 Rs—Reduce, Reuse, & Recycle. The design includes a simulated wind turbine, a solar cell panel, an electric inverter for generating electricity, a rain barrel for collecting rain, a biofacade which uses the natural cycle of plant growth to provide shading, a blind that can adjust the amount of sunlight and air circulation, as well as recycling bins. Whether your child is playing house, cars, or airplanes, you can breathe easy knowing that PlanToys are made of organic rubberwood, e-zero glue, water-based dyes, recycled and recyclable materials, as well as soy and water-based ink with the utmost respect for our environment and our children. 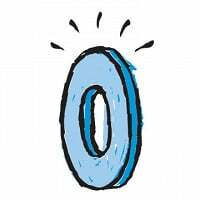 Amy here from The Grommet filling in for Plan Toys. I'm very excited about these dollhouses today. They're some of the most unique, progressive dollhouses that I've ever seen. Check out the small details on each one and be sure to let me know of any questions you may have. Can the dolls also be ordered? The dolls aren't sold separately. Thanks for your question. Love these! I grew up with all sorts of Fisher-Price buildings. My nephews are growing too old for them now so my Mom donated them to a local thrift organization hoping other kids would get as much use out of them as 2 generations of our family did. It brought back happy memories to see them again when she boxed them to go, but I lamented their non-recyclability - sooner or later they will reach an end of life, likely in a landfill. What I see in this Grommet is structures that will not have an eternal end-of-life, thankfully. Thanks to PlanToys for thinking outside the box and incorporating sustainability in the product. I don't have youngin's to purchase for right now, but will wishlist the idea for future purchase prospects. This is really wonderful to hear, thanks for posting. The PlanToys doll houses are great in that they keep that old time feeling while updating it to the modern era. It also promotes eco-friendly living and thinking in children at a young age. Glad to see you like them. Happy Holidays. Inspired by the rubberwood trees of his youth, the founder and president of Thailand-based PlanToys, Vitool Viraponsavan, earned a degree in architecture and set out to build a more sustainable world one rubberwood toy at a time. Historically, when a rubberwood tree stopped producing latex, it was burned. In 1981, PlanToys became the first company to transform these natural beauties into eco-friendly play things. The company has also created a proprietary durable composite wood called PlanWood made from reclaimed wood particles leftover from their eco-friendly manufacturing processes. 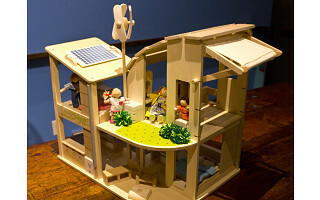 The Green Dollhouse turns green living into everyday play with a list of environmentally conscious features that inspire children’s imagination, while at the same time promote the 3 Rs—Reduce, Reuse, & Recycle. The design includes a simulated wind turbine, a solar cell panel, an electric inverter for generating electricity, a rain barrel for collecting rain, a biofacade which uses the natural cycle of plant growth to provide shading, a blind that can adjust the amount of sunlight and air circulation, as well as recycling bins.